The Bible says men and women are different, but secular sources have a hard time making up their minds on the question. The president of Harvard University has provoked a furore by arguing that men outperform women in maths and sciences because of biological difference, and discrimination is no longer a career barrier for female academics. In reality, the comments were much more nuanced than that, and full of disclaimers. why is the representation even lower and more problematic in science and engineering than it is in other fields. And here, you can get a fair distance, it seems to me, looking at a relatively simple hypothesis. 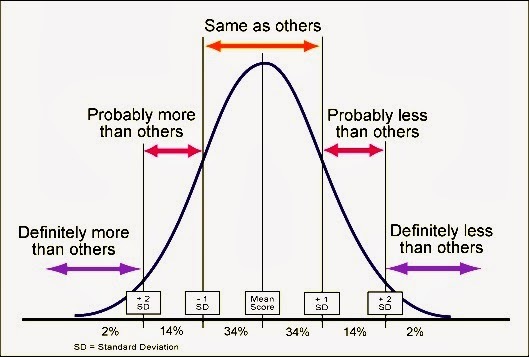 It does appear that on many, many different human attributes—height, weight, propensity for criminality, overall IQ, mathematical ability, scientific ability—there is relatively clear evidence that whatever the difference in means—which can be debated—there is a difference in the standard deviation, and variability of a male and a female population. And that is true with respect to attributes that are and are not plausibly, culturally determined. If one supposes, as I think is reasonable, that if one is talking about physicists at a top twenty-five research university, one is not talking about people who are two standard deviations above the mean. And perhaps it's not even talking about somebody who is three standard deviations above the mean. But it's talking about people who are three and a half, four standard deviations above the mean in the one in 5,000, one in 10,000 class. Even small differences in the standard deviation will translate into very large differences in the available pool substantially out. And so on. You can read his comments here. From the reaction, it was obvious that in his circles it was not ok to suggest that men’s and women’s brains are different in any way that would affect math and science skills. However, in similar demographic circles it's ok to say that men's and women's brains are very different in structure. A transgender male-turning-female was in the news the other day, and the article cited two studies indicating that the brains of transgender people are more like the brains of the gender they identify with than the one they were born with. Wait, they're actually saying that male and female brains are inherently different? Yes. So maybe it’s not so farfetched to say we have different abilities. In general. This is a bell curve. You’ll notice that in the center we have the highest numbers for this trait, with the high and low extremes off to the sides. I am guessing that if you graphed stereotypically male traits in men, such as strategy, aggression, seeing the big picture, taking risks, and tossing into the air and hopefully catching any object that isn’t nailed down, it would look like a typical bell curve. Extremes on the ends, most people in the middle. If you graphed the same for women, you would actually have some overlap, with a few women showing more aggression and big-picture analytical skills than some men. Those would be the Deborahs, Jaels, and Margaret Thatchers among us. And the graphs would be reversed if you graphed traits like intuition, collaboration, sensing double meanings, noticing details, and knowing if a child is about to throw up. Most women would be high in these traits, most men would be low, but some men would rank higher than some women. There seems to be an awful lot of hand-wringing in the media about the under-representation of women in politics, STEM jobs, and the top echelons of business. If it’s because of deliberate exclusion and injustice and laziness, that isn’t right and ought to be rectified. But there seem to be a lot of opportunities open to women, with anti-discrimination laws and with women earning more college degrees than men. My engineering-program sons report that the higher you go in college math and science, the fewer women there are, despite the fact that women are as free to take these classes as any other, and they are not ridiculed by the guys. When I was in high school and college, I took quite a few math and science classes, and did well in my spot on the narrow end of the curve. Thankfully no one ever gushed at how well I did "for a girl." I was encouraged but not pushed. If I hadn't gotten married I might have pursued a career in medicine or teaching math, but I knew I didn't have the energy for making both a home and a career, and what I did "extra" I wanted to do from home. With the inquisitive children I was given, I was grateful later for all the math and science courses I had taken. I never considered them wasted. But back to genders and brains. Maybe we are actually wired differently, and we ought to work with our inborn gifts. Maybe it’s a bit silly to get all frantic and to try to artificially inflate the female numbers at the top of these fields. Maybe we ought to assign a little more honor to the compassionate CNA passing the meds to your grandma in the nursing home and a bit less to Sheryl Sandberg heading things up at Facebook and trying to whip up a frenzy of “leadership skills” in girls and telling us not to use the word “bossy” for fear of damaging assertive girls. I believe God created us to be people, first of all, and then either male or female. He also designed roles appropriate for each gender, and this is the part where people in the Western world, both believers and non-, erupt in your face like this old rooster we used to have, with terrible squawks and flapping feathers. Things haven’t gone so well in our culture, family-and-relationship-wise, what with divorces and young single pregnant women and absconding fathers and cheating partners. And an awful lot of chaos and unhappiness. The Bible says that men and women are equal before God in terms of value but different in design and therefore different in the roles they fill best. Maybe we should all try the Biblical pattern for a month and see what happens. But this is not a specific how-to. Many years ago I got married. I realized that those Bible verses about wives submitting to husbands now applied to me. Wow. How was that supposed to work? I was a Bible-believing Christian so I’d better get busy. But I did worry about it, which probably wasn’t very submissive. One day I realized that the command was God telling wives to submit, not telling husbands to make sure their wives submitted to them. So the issue was entirely between me and God. I also came to realize that submission for me meant trusting God to work in Paul’s life and not me making it my job to nag, or to protect either of us from the consequences of his choices. It also meant communicating. I was a hinter but Paul was a guy who needed a two by four. It eventually worked out to something of a four-step process. 1. Tell Paul exactly how I think and feel, loud and clear. One time. Because there was plenty to watch. It was astonishing, the things that happened when I communicated clearly and then backed off and prayed, stuff I could never have orchestrated on my own. I took this as God’s blessing on my decisions. Since I am that sort of person, I thought I would share this insight with the good people who read the Mennonite Sunday school papers. I wrote up an article and Christian Light accepted it. I thought I had made it very clear that this was my experience and I couldn’t speak for anyone else. But women everywhere took it as some sort of new edict from above—Proverbs 32. Ladies’ Sunday school teachers read it to their classes. A woman from New Jersey wrote to me and asked for advice because she wanted to wear a head covering—which shows submission, you know--but her husband didn’t want her to and what should she do? One woman I know hid the article so her husband wouldn’t read it. That’s the trouble with writing about gender and marriage. Some people are all about formulas. And having someone tell you exactly what to do in every circumstance. And about taking a writer way too seriously. You need to worry about what God says and what works for you. Not what I think. The Bible says a man’s role in the family is to lead, provide, and protect. And to love. A woman’s is to help and keep and submit. And to respect. You figure it out from there. Both men and women are supposed to love God, pursue justice, love mercy, be reconciled, forgive, repent, be kind, remember the poor, be thankful, keep your vows, and about a hundred other things that apply to you regardless of gender or marital status. If you are both doing all that, the lead/submit matter will not be a big deal in your marriage. "Yes, actually," the 27-year-old said. "He's totally in charge. I mean, when I am home, I am like, shoes are off, I'm making him dinner. He has a job, too, and he is really busy!" "I'm in charge all day long, the last thing I want to do is tell him what to do," she explained. "It's not good for relationships to tell men what to do." Frankly, she’s more submissive than I am. Like I said, if this idea makes you angry, maybe you should try it for a month and see what happens. If God blesses you for it, you might decide to keep on. If Lady Gaga and I can figure this out, so can you. Tomorrow: Gender roles in society and the bell curve. Two trucks parked on the road by our house the other day. Six men in yellow vests got out. One man got into a cherry-picker on the white truck and hoisted himself way up into the oak tree on the other side of the road. He got out a small chain saw and revved it up and started cutting off branches that hung out over the road. The other men watched. Then, when he paused, they picked up the branches and tossed them into the wood shredder behind the red truck. Then they swept the road with a broom. a) Jenny and I could do that. By ourselves. b) Why is it all men doing that job? c) Why does it take six of them? The “six of them” is a whole other issue that I will let people like Glenn Beck discuss, but the fact that it was all men—is there something inherent about that job that necessitates men to do it? Some tasks are innately male or female, such as fathering or bearing or nursing a child. But what about work in general? Part of what makes some people insist that there aren’t any innate differences between men and women is the fact that different cultures assign very different jobs to men and women. Women grow the food in Kenya. Men do the driving in Saudi Arabia. In Bible times, women carried water. In the story of Abraham’s servant at the well, Rebekah drew water for the servant and offered to water his camels as well. He didn’t offer to help her. In contrast, when we lived in the North and carried our water from the lake, I was happy to play the “weaker vessel” card and let Paul do all the water-hauling. When Jesus is preparing for the Last Supper, Mark 14:13 says: So he sent two of his disciples, telling them, “Go into the city, and a man carrying a jar of water will meet you. Follow him. Apparently the notable thing was that it would be a man and not a woman carrying the water. There are other examples of tasks in the Bible differing from our customs. In Exodus 35, God is telling Moses how to build the tabernacle. Interesting, isn’t it? Men, filled with the Spirit of God, doing weaving and embroidery. Other Scriptures indicate that expectations in other areas were different from what we’d expect. Proverbs 31 describes the virtuous woman’s arms being strong for her tasks. The male Psalmists describe intense emotions--joy, weeping, regret. David danced so much in public he embarrassed his wife. God and earthly fathers are portrayed as gentle and compassionate. Psalm 103:13--Like as a father pitieth his children, so the Lord pitieth them that fear him. As I implied in Post 6, if it isn’t specified in Scripture, we need to be cautious about assigning certain tasks or traits as women-only or men-only. I'm guessing the predominance of men in jobs like construction and branch-trimming is a holdover from the days when those jobs were very physically demanding. Also, and this is just me talking: I think most men get a bigger thrill out of driving big trucks, revving chain saws, and shredding wood than most women do. So: there wouldn’t be anything morally wrong or physically impossible about Jenny and me cutting and chopping branches. I think Saudi women should be allowed to drive. That Midwestern church I mentioned earlier would be wise, in my opinion, to allow ladies the option of going hunting. And if their men want to embroider like Bezalel and Oholiab, God bless them. Scripture is much more specific about roles in general than tasks in particular. Tomorrow. Let me direct you to the book of Judges, chapter 4, in the Bible. It’s the vivid and gruesome story of how Sisera, the ruler who “cruelly oppressed” Israel for 20 years, met his end. Most of the Old Testament war stories are entirely full of men and their exploits, but this one features two women—Deborah, who was leading Israel, and Jael, who let Sisera believe she was an ally and who very decisively proved otherwise. Actually, rather than retell the whole story, I’ll let you read it for yourself here. Nowhere does the story imply anything but that they did what they did entirely as women. They didn’t dress up in men’s uniforms or armor. They are not described as being like men or of having man-like qualities of bravery or cleverness. They did what they did fully as women. In the next chapter, Deborah and Barak sing a song of celebration. In it, they refer to Deborah and Jael in the most female roles possible—wife and mother. I think we would all agree that fighting was generally the men’s domain. But, in this case, when the need arose, the women did what needed to be done, and their success was celebrated. The land then had peace for forty years, so we assume that Deborah went back to judging and Jael went back to her tent and was a good wife for Heber and milked the cow twice a day and ordered a new tent peg off of Amazon. We don’t read that they went around trying to change women's roles in society and spoke at high schools and told girls they can be anything they want to be, including warriors going to battle. a) Some roles, duties, and exploits are normally the domain of men, and that’s ok.
b) If the occasion calls for it and they have the skills, women may and can do them as well, and that’s ok too. c) The reverse is also true. d) Doing the occasional task of the other gender doesn't make you less of yours.